Many molecular features contribute to the antimicrobial activity of peptides. 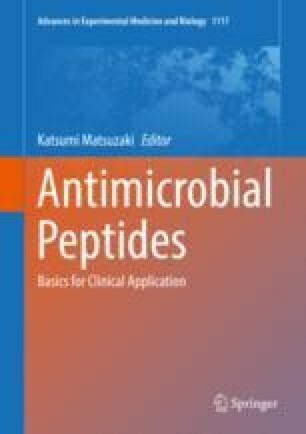 One aspect that contributes to the antimicrobial activity of a peptide, in many cases, results from the fact that many antimicrobial peptides are polycationic and the lipids on the surface of bacteria are often anionic. In certain cases this can result in the clustering of anionic lipids as a result of the binding of the cationic peptide to the surface of the bacterial membrane. This lipid clustering can be detrimental to the viability of the bacteria to which the peptide binds. Several factors, including the charge, size, and conformational flexibility of the peptide, will determine the efficiency of lipid clustering. In addition, the lipid composition of the bacterial membrane is very variable, and it plays a critical role in this mechanism. As a result, one can test the importance of this factor by determining the species specificity of the antimicrobial activity of the peptide. The molecular mechanism by which lipid clustering affects bacterial viability is uncertain in many cases. This phenomenon can be used to increase the antimicrobial potency of peptides in some case and can also predict the bacterial species specificity of some agents.